It's that time of year when parents and carers of children with long-term health conditions begin to feel nervous. How do we ensure their wellness through the colder months? The germs are breeding, school is a viral soup and we begin to wonder if we'll make it through the Winter without a period of hospitalisation. Often this simply can't be avoided, but there are a few tips we can all follow to try to keep those more serious chest infections at bay. It's worth a shot at least. Flu vaccinations are advisable for those with a medical condition that makes them more vulnerable, such as a heart condition. Carers and family of those in this category may also be eligible for a free flu jab on the NHS, to increase protection, so book yours today. This year all children aged 2-4 will be offered a nasal spray flu vaccine. Enough sleep is vitial if we are to keep our immune systems in good shape but this is often a commodity we simply don't get enough of. In Winter we actually need more sleep as the daylight hours diminish but a blocked nose is always much worse at night. It can make breathing difficult, and cause frequent waking. Saline sprays and nose aspirators for babies (or a snot sucker as we used to call it in our house) can go some way towards keeping the airways clear, and another soothing approach is to use steam inhalations to help everyone get a good night’s rest. A warm bath before bedtime can help ease congestion, or try using a humidifier to produce steam in your child’s bedroom, the most powerful weapon against croup there is. A massage or a story in the evening can help relax children into much needed sleep, giving you some rest too. You can also try tilting your child's bed by propping the head end up on a couple of large books. This will help drain any mucus away and go some way to preventing 'post nasal drip', a common cause of croup. Many people don’t realise that constipation can be a big problem when it comes to reduced immune function. A sluggish digestive system caused by food stagnating in the intestines can eventually lead to toxic build up, poor elimination and increased formation of mucus. Many children are susceptible to constipation and may need a daily dose of a laxative such as Movocol, but also try to encourage them to up their fluid intake during the winter season. Drinking more water, and eating foods which contain plenty of natural fibre (such as seasonal greens and fresh fruit) will increase the frequency of bowel movements and make stools easier to pass. I bought a selection of fun beakers and straws to encourage increased fluid intake in my reluctant drinker. Germs that cause coughs and colds are easily spread and can survive on surfaces. Simply washing your hands, and hand towels more often will kill them and prevent spread of infection. 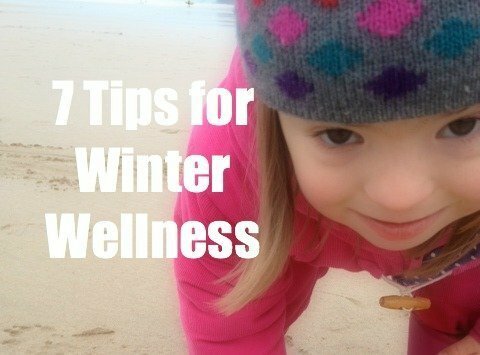 It sounds obvious, but it's ne of the most basic ways to ensure Winter wellness. According to Naturopath Sarah Murphy, chilli peppers are high in immune boosting vitamin C and anti-inflammatory vitamin A (essential for healthy mucus membranes.) Their peppery heat has the added bonus of stimulating secretions that can help clear congestion from the nasal passages and lungs. Add small amounts to baked beans or bolognaise to make the taste more palatable for little ones. Garlic, oregano, turmeric, onions and ginger should also be eaten freely. Try spicing apple sauce with cloves or nutmeg and cinammon too. All of these foods have powerful anti-bacterial properties which can help keep winter bugs at bay, so get cooking up a baby curry today or pack herbs and spices into a soup or stew. It's the time of year when I dig out my trusty slow cooker for such culinary delights. You could try making your own mucus-busting cordial which is a safe, effective remedy for general congestion, coughs and colds. Place a few sprigs of thyme in a teapot and add a pint of boiling water. Throw in a few sticks of cinnamon bark and several slices of freshly chopped ginger, then leave to infuse for about 10 – 15 minutes. Once the water has cooled, strain, and mix with a jar of good quality honey and about half a bag of brown sugar. Heat in a saucepan until the mixture begins to thicken. Once the syrup has cooled, store it in a clean glass bottle in the refrigerator. Take a teaspoon every morning, or add to warm water and lemon juice for a delicious bedtime drink. Herb teas can also be soothing and help thin mucus. Camomile tea with honey will help soothe off to sleep, and help to clear phlegm, but be wary of essential oils as they can irritate the airways. Many people spend too much time indoors during the winter months. Getting out and about in the fresh air can do the whole family a power of good. There’s no need to fear 'catching cold' providing you are all suitably dressed. Try going for a walk in a park or collecting leaves in a wood. Turn it into a fun activity for everyone to enjoy together. Fresh air is one of the best ways to blow away the cobwebs and dry out mucus. White blood cells, (vital for the proper functioning of your immune system) need a good supply of oxygen to function effectively. Fresh air opens up your lungs and increases blood flow, meaning that any bugs and toxins circulating around your system will be flushed out much more quickly than if you spent 9 hours a day cooped up indoors. Exercise also boosts our mood and gives us much needed energy. Remember that antibiotics are not appropriate for minor viral infections, but you should always seek medical advice if your symptoms continue or worsen. What tips can you share about keeping your kids - and yourself - well this winter? Transfer from LDA to EHCP? Can I be bothered?